IT was great to catch up with our old mate Grant Hodges from Launceston the other day when he dropped into the Collinsvale container interchange. He was driving a 2007 Monson Logistics Iveco Stralis at the time with a 550 Iveco up front, and he had brought a couple of containers down from Burnie. Having dropped one at Collinsvale, he was on his way to Buckland on the east coast to load sand stone there. Grant has been with Monson Logistics for six-and-a-half years now, since leaving FCL, and he is still happy with the job and the outfit. 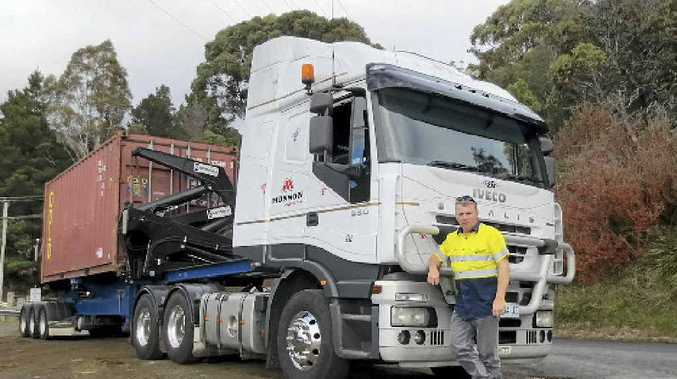 He also likes the Stralis, which he finds ideal for the side-loader work he does, and he was happy to tell us that Sean Hinds' fiancé, Susan, is still recovering well from her horrific problems of December 2011, and should be out of hospital soon and back home with Sean and the girls.